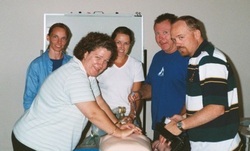 Have your Advanced Life Support Level 2 certification renewed by attending this one day course. Covers advanced resuscitation skills designed for the health care professional to develop leadership skills as well as critical thinking and decision making skills. From May 2018 Health Ed Professionals Pty Ltd will be conducting the course. The course is endorsed by Australian College of Nursing (ACN) and is conducted over one day, with a pre-reading component. It reflects the latest Australia New Zealand Committee of Resuscitation (ANZCOR) 2016 guidelines relating to advanced life support. The course also earns you 7 Continuing Nursing Education (CNE) points. 10 ALS, 4 PRPD & 2 Core Points + 14 PRPD Anaesthetics and EM MOPS Points. The pre reading component is sent upon registration; time should be allowed to complete this before the course commencement. Workbook is included, certificate is awarded upon successful completion. Course costs are under review, the prices for future courses will be displayed when registering. Develop knowledge, skills and confidence in a supportive and friendly environment. Minimise the stress & fear that being confronted with this situation can cause you. Places are not guaranteed until the completed registration form and payment is received. The course is taught by two highly qualified and experienced nurse educators; Ms. Anne Evans-Murray and Ms. Roseann Jane. Anne is a critical care nurse educator with more than 26 years’ experience in clinical teaching both in the hospital and tertiary sector and she is currently a casual lecturer in the Bond University’s Faculty of Health Science and Medicine MBBS program. She is a Professional Registered Counsellor as well and has her own health education business and counselling practice. Anne is a national and international lecturer, presenting seminars on general nursing, high dependency, assessment skills of the deteriorating patient and interpretation of ECG skills. These topics are taught in seminars in both Australia and New Zealand, to a broad range of health care professionals including paramedics, nurses and doctors. Anne has had extensive experience in teaching advanced life support to nurses and doctors for over 25 years. Anne is also a successful author of two clinical nursing education texts; ECGs Simply, Interpretation of Chest X-rays Simply, and her most recent book from her counselling practice and experience; Uncomplicating Life – Simply. Roseann is a critical care nurse educator with more than 22 years experience in clinical teaching both in the hospital and tertiary sector. She is a very experienced Intensive Care Nurse, Cardiothoracic Nurse and has been teaching Advanced Life Support for over 20 years. Roseann is currently employed at the Gold Coast University Hospital where she is responsible for the education of Intensive Care Nurses. She is also involved in the facilitation of education for nursing students in the masters program, and undergraduates. She has many years experience in providing education of the critically ill patient. Attendance of this course earns you 7 Professional Development points.